This student submission comes from my former student Joe Wood. His topic, from Precalculus: inverse trigonometric functions. Trig functions have a very long history spanning many countries and cultures. Greek astronomers such as Aristarchus, Claudius, and Ptolemy first used trigonometry; however, according to the University of Connecticut, these Greek astronomers were primarily concerned with “the length of the chord of a circle as a function of the circular arc joining its endpoints.” Many of these astronomers, Ptolemy especially, were concerned with planetary and celestial body’s rotations, so this made sense. While the Greeks first studied trigonometric concepts, it was the Indian people who really studied sine and cosine functions with the angle as a variable. The information was then brought to the Arabic and Persian cultures. One significant figure, a Persian by the name Abu Rayhan Biruni, used trig to accurately estimate the circumference of Earth and its radius before the end of the 11th century. Fast-forward about 700 years, a Swiss mathematician, Daniel Bernoulli, used the “A.sin” notation to represent the inverse of sine. Shortly after, another Swiss mathematician used “A t” to represent the inverse of tangent. That man was none other than Leonhard Euler. It was not until 1813 that the notation sin-1 and tan-1 were introduced by Sir John Fredrick William Herschel, an English mathematician. As we can see, the development of inverse trigonometric functions took quite the cultural rollercoaster ride before stopping some place we see being familiar. It took many cultures, and even more years to develop this sophisticated branch of mathematics. Last Semester I taught a lesson on the trigonometric identities. 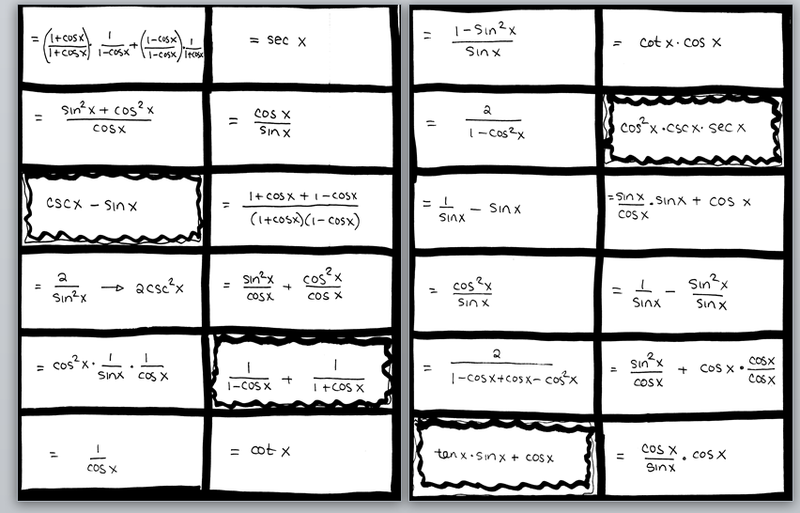 I found this cool cut and paste activity for the students that allowed them to warm up to the trig identities by not having to do the process themselves, but still having to see every step of converting one trig function into another with the identities. Below, you will find the activity, then the instructions, and finally how to modify the activity to fit inverse trig identities specifically. 1.) Begin by cutting out all the pieces. 2.) Students will take any of the four puzzle pieces with the black squiggly line. 3.) Find an equivalent puzzle piece by using some trig identity. 4.) Repeat step 3 until there are no more equivalent pieces. 5.) Grab the next puzzle pieces with the black squiggly line. 6.) Repeat steps 3-5 until all puzzle pieces have been used. Ex.) Begin with cscx-sinx. Lay next to that piece, the piece that reads =1/sinx – sinx, then the piece that reads =1/sinx – sin2x/sinx. Contiue the trend until you reach =cotx * cosx. Then move to the next squiggly lined piece. This game can be modified using inverse trig functions. Start with pieces such as sin-1(sin(300)) in squiggles. Have a piece showing sin-1(sin(300)) with a line through the sines. Then a piece that just shows 300. Next a piece in a squiggly line that is sin-1(sqrt(2)/2) that connects to a piece of 450, but make them write why this works. Obviously, by this time students should know what trigonometric functions are and how to use this. Students should also know from previous classes what inverse functions are. Studying inverse trig functions then is a continuation of these topics. As I teacher I would begin relating inverse trig functions by refreshing the students on what inverse functions are. The class would then move into the concept that the trig expression of an angle returns a ratio of two sides of a triangle. We would slowly move into what happens then if you know the sides of a triangle but need the angle. From there we would discuss trigonometric expressions using the angles as variables. Finally, we would make the connection that that is a function, and on the proper interval should have an inverse function. That is when the extension into the new topic of inverse trigonometric functions would seriously begin. The inverse trig functions were, for me, strangely compelling as they were. I think it was their blend of having a familiar sound — trigonometry, everyone’s heard of that — with the exoticizing prefix of ‘inverse’ that made them sound like these hidden, secret things that only the elect may know, much less master. So I never had trouble being interested in them. This is not something that would appeal to any normal person, though.